Valentine's Bash - Flight Contest! Does it need to be the same player that you have to flight up with for those 15 days? Feels trampy if you fly with a different player every day just for the combat points but would probably work better to winning the gold. Just remember to practice safe flights. I am looking for a flight mate for this event. You have to be gud. Might help the entry levels if chat was working 100% - which is not the case right now. Just giving you a hint there. I've edited the main post to include the fix we have for the particular issue - hopefully for most people that are currently experiencing this issue, this should solve it. I tried that multiple times, chat is still down. Do all 15 battles have to be with the same person? Or as long as you play a minimum of 15 flighted battles, you qualify? 3) In the menu that appears, select the option "Launch the game and clear its cached data"
If the recommended fix does not address the issue for you, please send a ticket to our Customer Support for further assistance. I literally clear my cache everytime whenever I start playing. Chat is always down. I am not sure how support will help me with that. Youtube Channel for some cool videos! I'm sure WG has a crack team of highly skilled software technicians working on a fix. Right? Support ticket. Haha Hahaha HA HAHAHAHA! Good one! Is there anyway to check how we are doing? So I just form a flight and fly 15 or more battles? Do I have to post in here to qualify? You don't need to post, but it is always a good idea to keep your own screen shots. All of our support reps are people, and try to help as much as they can. (the only "Chat bots are actually the ones in game ;) ) Clearing the game cache has helped restore chat functionality. (Tested it myself when Mine wasn't working) Other than that make sure that port 5022 is open as that's the port that chat uses. Using the WGcheck tool should open the necessary ports automatically. I like this contest but I was thinking maybe have a 2nd and 3rd place prize too like WG use too. 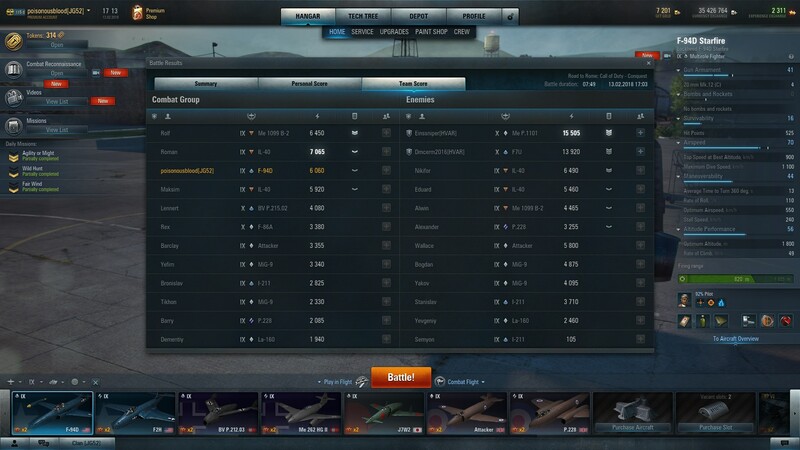 Maybe 1 premium plane choice for 2nd place and say 200 gold and 3 days premium for 3rd. Shows the other flights that put a lot of effort in to the event that even if they can not get 1st there is a chance to win something. Thanks for the broken mm that people are misusing it. please give them the gold planes. They deserve to win your competition. 15,505, shouldn't be that hard to beat. I have seen people posting 20,000+ games. I'll be playing tonight starting at 9:30pm ET, looking for a flight mate. So dfar I am at 2/15 of the minimum required flight battles. Having the contacts list broken doesn't help. Edited by MARS_REVENANT, 13 February 2018 - 04:41 PM. So, I posted a ticket to support with this as a reply. Everything in my computer is fine, every game is working as well. Even World of Tanks. 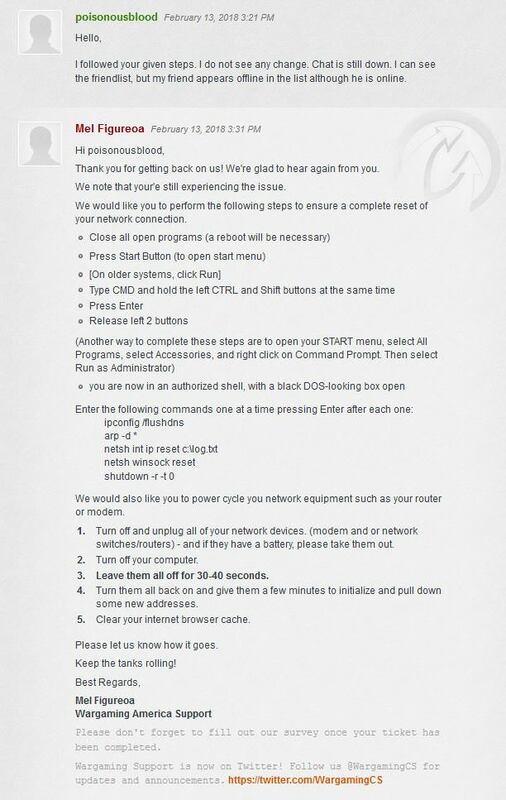 But chat is still down, so it must be my network's and pc's fault. Is this cumulative over the duration of the contest, or the flight with the best battle/highest combat points in a single battle? The Flight that has accumulated the most Combat Points by the end of the contest will win 2 Premium Planes of their choice from the list below for each of the Pilots! The Flight that has the most Combat Points by the end of contest timeframe will win! Edited by MARS_REVENANT, 14 February 2018 - 06:35 AM. ​not really that confusing. Everything in that posts implies a grand total of points over the set duration. Accumulate = to increase gradually in quantity or number. Amount = a quantity of something. Most = greatest in amount. All three words in WG's post clearly mean a total of more than one battle. Also why would they ask for a minimum of 15 battles if the contest was based on the results of one? Edited by Rythcan, 14 February 2018 - 09:02 AM.